Prev Hersheypark: 20 Tips, Tricks and Must-Do Attractions for Families Next Globetrotting and Homeschooling and More, Oh My! When your kids are babies and toddlers, you can pretty much take a family vacation anywhere you can carry them. However, once they hit the tween and teen years, it gets a little trickier to find a family trip that works for everyone. Not all parents enjoy theme parks, and not all kids enjoy relaxing on a lounger and reading a novel. At least my kids don’t, which is why my copy of “Eat, Pray, Love” is currently on the bottom of a pool somewhere in Florida. 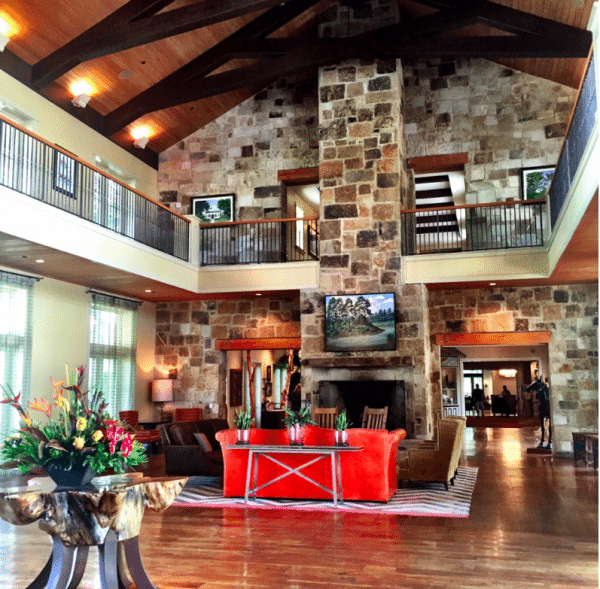 One of the most impressive things about Lost Pines is how well it does “Texas.” The vibe here isn’t over-the-top-rhinestone-Texas, it’s the much more desirable Hill-Country-Outdoor-Kick-Back-Texas. You notice this in the decor, in the restaurant offerings, and in the full day’s schedule of activities that includes things like horseshoes, storytellin’ (no “g”), live music, falconry shows, kayaking and rafting, horseback riding, archery tag (so cool), fly fishing, and so much more that I can’t even type it all or my fingers will get sore. 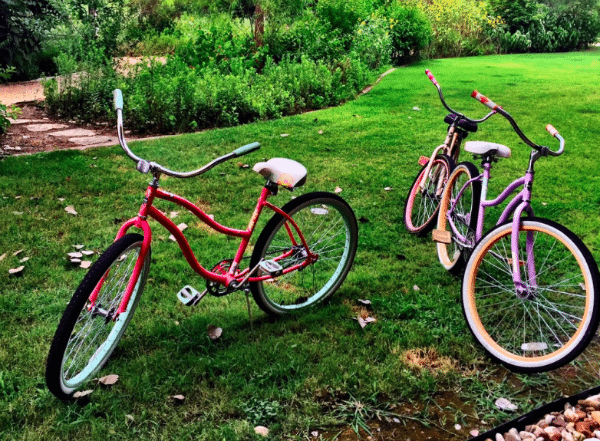 Because my kids are 12 and 14, and because Lost Pines is pretty contained and they each have cell phones, we let them go off and do a lot of activities on their own. 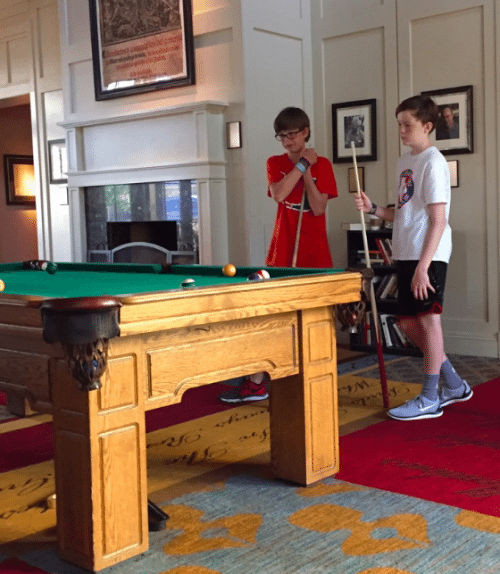 They loved the freedom of coming and going, and kept busy playing basketball, tennis, shuffleboard, and both indoor and outdoor ping pong, then losing a few dollars on the billiards game they played against a couple teen pool sharks from Houston. I told them to never go for the side pocket. While the boys were busy with their fun, my husband and I napped a bit, then got active via bike rides. He pedaled 30 miles on his own road bike that he brought with us. I pedaled 100 feet, on one of the resort’s bikes, to the store in the lobby that sells Starbucks coffee and breakfast tacos. Kind of the same thing, really. But I also used my free time to go to a yoga class, to the fitness center, and to a really fun activity where you drink wine and paint a picture while a nice teacher pretends you have artistic talent. How cute are these, I ask? Lest you think we didn’t spend any time together as a family at Lost Pines, we for sure did. See? 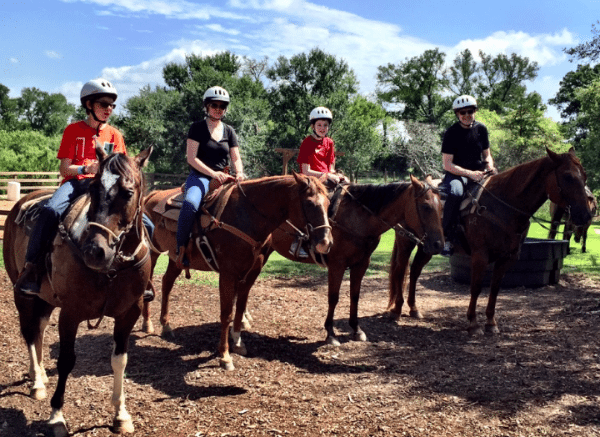 Here we are looking tough on a horseback trail ride. Too bad there wasn’t a train nearby or The Aarons Gang could have totally robbed it. Right after my horse stopped peeing. We also all had a great time together at the only-for-resort-guests Crooked River Water Park that includes a main pool, an adult-only pool (YES! 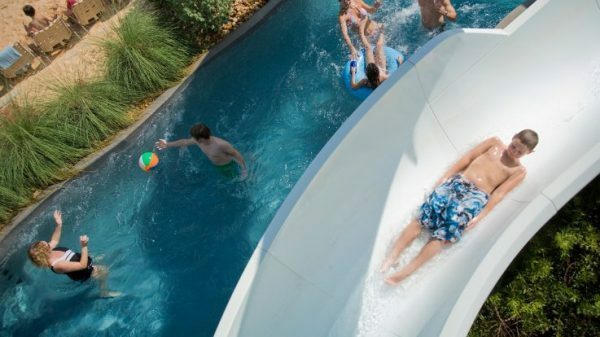 ), a waterslide, a splash pad, and a Lazy River. There are plenty of chaise lounge chairs and umbrellas for you to use, and if you’re extra fancy, you can even pay to reserve a private cabana. (Note: Lazy River not so lazy when a certain someone tries to get in a float tube in her skirtini.) We spent hours relaxing and playing here, and even had a few poolside meals. And by “meals,” I mean they had chicken tenders and I had Shiner beer, but everyone was happy. 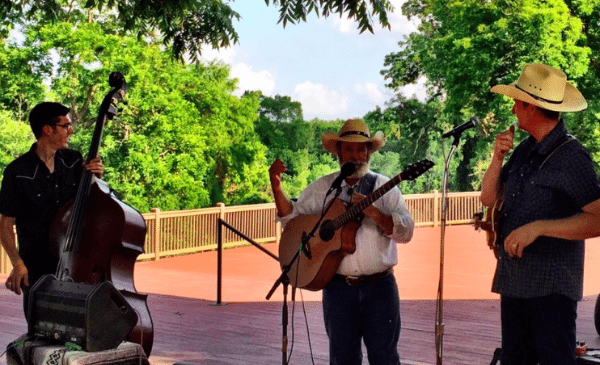 One day a few locals serenaded us with one of my favorite songs, “Luckenbach, Texas.” Can’t beat that. Did I mention the animals at Lost Pines? And I’m not talking about your pet dog that you’re allowed to bring along if you’re a hotel guest, either, I’m talking about the resort’s “Hooves and Horns” mascot program that features two Texas longhorns, one American mustang, two miniature horses, two alpacas and one precocious pup named Boots who has his own little area in the lobby. You can see all of these guys via meet-and-greets and photo ops. 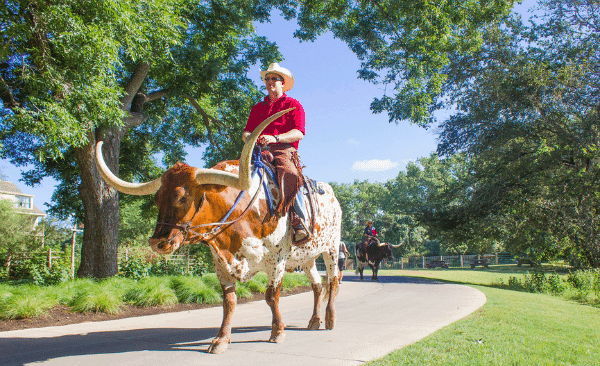 Seriously, want to sit atop a longhorn? This is your chance! But you’re not allowed to ride them–that’s best left to the professionals because guess what happens when you mess with a bull? You get the horns, that’s what. 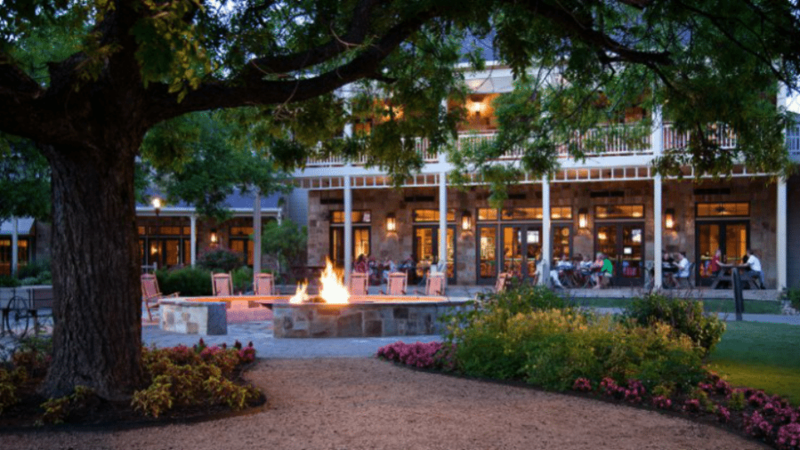 Now, on to the dining: Regency Hyatt Lost Pines has eight eating and drinking establishments, ranging in offerings from light snacks to fine dining, so you’re set for your entire stay (food prices are not included in room rate). There’s the AAA Four Diamond-rated Stories restaurant (one of only five restaurants in Austin with the designation) for farm-to-table, true to Texas treats like braised antelope flank and grilled Texas shrimp. We enjoyed the more casual restaurant options, Firewheel Cafe (that serves breakfast, lunch and dinner) and Shellers Barrelhouse Bar, where the food is also really fresh and local, but you don’t have to worry about being embarrassed if your kids spill water all over the table. Plus Shellers has TVs with sports, so the boys they loved hanging out there. 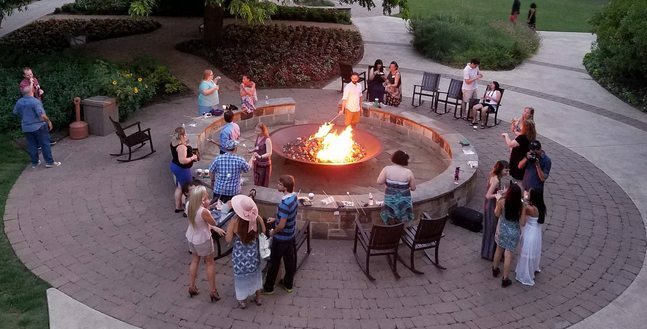 One night, the Hyatt held a BBQ event in one of their covered pavilions and we loved it. We had amazingly great steak, chicken, and all of the sides you could want for individual purchase. The boys still talk about it, and I think they’d go back just to eat cowboy-style again. So that’s it! 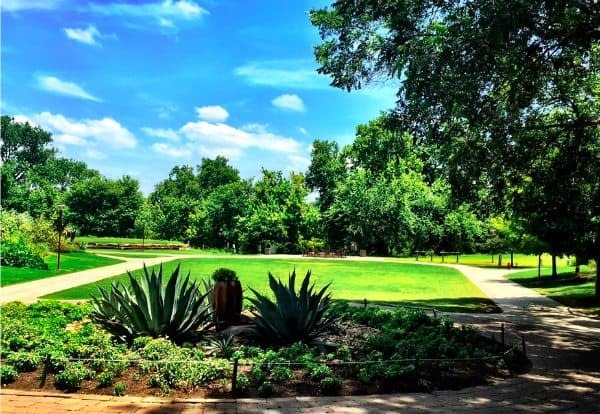 If you’re looking for a quick weekend away, or if you really want to experience “Texas” in the best way possible, take a look at Regency Hyatt Lost Pines as a destination for a family vacation. It’s fun for even just one night, but I recommend staying a little longer so you can take advantage of everything they offer. Plus, more nights at Lost Pines = more s’mores. Thank you to Regency Hyatt Lost Pines for hosting my family for a weekend. We had a wonderful time. All opinions, experiences, and extra marshmallows, are mine.